Real Madrid keep their fight for La Liga and remain just one point behind leaders Barcelona thanks to a great victory against Villarreal. Zinedine Zidane men played a superb game and earned all three points thanks to goals from Karim Benzema, Lucas Vazquez and Luka Modric. 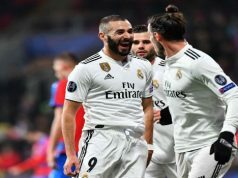 Los Blancos had the first opportunity to score as Benzema sent a powerful strike but Sergio Asenjo got down to keep it out. Villarreal gained controlled of possession after a while, but Real kept threatening. Vasquez struck towards goal after meeting an excellent pass from Modric, but his effort moved wide of the post. 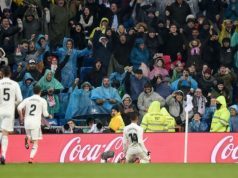 Right before the break, Benzema made it 1-0 as he headed home from close range after Asenjo had palmed a low cross from Ronaldo straight into his path. 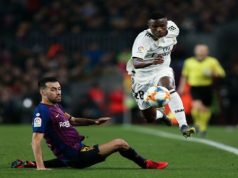 The goal helped Los Merengues gained confidence and they improved their game in the second half. They were in total control of possession and playing beautifully. Modric missed a great chance as he curled one wide of the post. But a few minutes later Lucas Vazquez sealed the victory with a superb play. The youngster combined with Benzema before finding the bottom corner with a perfect strike from the edge of the box. Modric made it 3-0 as he expertly volleyed a Danilo cross into the back of the net following a brilliant counter-attack from Los Blancos.